The Chinese economy has entered the Year of the Rooster on a reasonably positive note according to a number of key indicators. Manufacturing survey data is holding firmly in expansionary territory, inflation measures have jumped significantly, money supply continues to swell and the prices of key industrial commodities have bounced hard and fast. Policymakers’ stimulus efforts to revitalise the economy after a concerning start to 2016 have certainly had an impact. However, these expansionary measures have also clearly had skewed and undesired consequences, such as the Chinese credit market. Like a Chinese hot pot, the country’s credit arena is bubbly opaque mixture that hides a number of concerning ingredients. There has been a clear winner from the central bank’s latest top-ups to the pot, namely the so-called ‘Old Economy’. This consists of industries, the influence of which the leadership is trying to shrink, including steel makers, miners and other heavy industry. 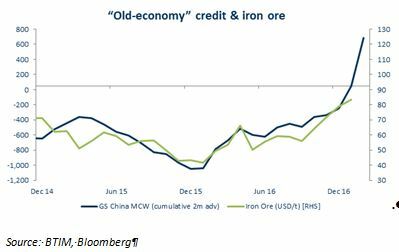 The flow-on effect has been a ramp-up in demand for commodities like iron ore and, as illustrated below, a significant rebound in prices. 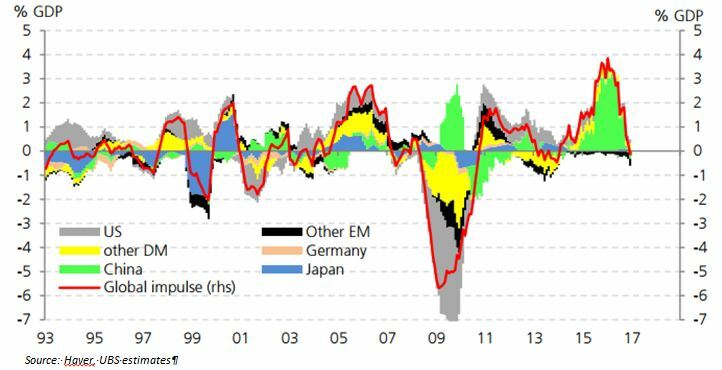 There is also a strong correlation between credit flows to the Old Economy and the pick-up in manufacturing sector activity. These developments may have been supportive for Australia’s terms of trade and the Australian dollar, yet they are not the ideal outcome for Chinese policymakers. As frequently cited, their preference is for a managed transition from growth led by manufacturing and construction to consumption and investment. 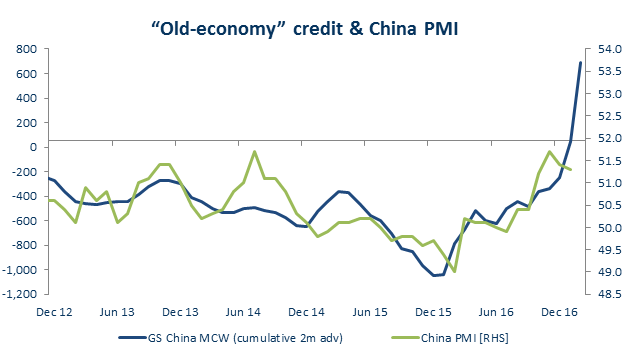 A broader measure of credit activity such as ‘Credit Impulse’, which illustrates the change in new credit issued as a percentage of GDP, is actually now negative in China as shown in the chart below. This reflects decelerating growth in lending and has strong negative implications for private sector demand. It also highlights the extent to which global credit growth has been driven by China. The trend is concerning because it suggests the PBoC’s attempts at supporting growth are skewed and ultimately less effective than prior efforts. At the same time it is fighting the highly-publicised battle to slow the Yuan’s depreciation. This is a particularly important row it cannot afford to lose. Chinese corporates are some of the most indebted in the world (Chart 4), which in itself is a red flag. Its significance really stems from the large portion of debt denominated in US dollars, meaning as the Yuan depreciates, the local currency value increases. Even if policymakers ratcheted up rates to defend the currency it would raise local borrowing costs, leaving them between a rock and a hard place. If the raft of unorthodox measures taken to prop up the country’s coal and steel industries were anything to go by, officials are prepared to do anything to avoid defaults. As noted in media reports, over 65 million tonnes and 290 million tonnes of steel and coal capacity were cut in 2016 and 700,000 workers in the sectors relocated. The emergency policies signalled not just fear of one sector falling over, but fear of contagion and perhaps even fear of losing face. However, despite such fears, policymakers may find efforts to avoid defaults and support the broader economy ultimately just turn up the heat on an already dangerously bubbly hot pot.